Kawazu Sakura is fully bloomming !! 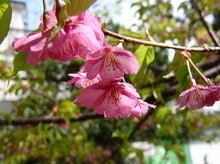 According to the local newspaper "Izu Shinbun", Kawazu town declared " Kawazu sakura trees are fully blooming !" Every year Kawazu Sakura Festival has over one million people to visit this festival. On last Saturday, February 25th, about 65 thousand people visited a day. It was a 1st record during this season. If you have ever seen Kawazu Sakura, you can notice the difference of it soon. When we moved here Shirahama we went to Kawazu town to see Sakura festival, and hoped to have same Sakura tree in our garden. But we could not find easily this tree in those days. So we brought the seed of Kawazu Sakura and raised it. And these trees could have flowers at last, but the color is different from original tree. Sakura in a first photo is really pink, and second one is white and pink just like "Someiyoshino", Japanese national tree. Anyway, our Sakura trees have fully bloomed. 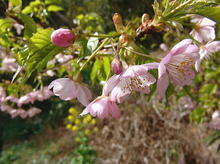 Yes, the spring has come in Shirahama ! This entry was posted in Flower on 2006年2月27日 by izusakuraya.